Conflicts can break the backbone of a society and produce generations of weak and apathetic citizens. It can also create music and encourage creativity. The Peace Club, born in 2011, was the result of the Rabha and Garo conflict on the Assam-Meghalaya border. “While we were visiting different relief and transit camps, we found that they need some meaningful show, entertainment or play. To bring together both communities to one place we organised a one act play about the topic love and forgiveness,” says KD Momin, the founder member of the club. The play was staged on August 15 of the year in Resubelpara civil sub-division before North Garo Hills district was formed. The play, and especially the initiative, was well received and the club got official recognition from the deputy commissioner of East Garo Hills on December 20 of the same year. The club started with 40 members, all between the age of 12 and 22 years. It would only perform dramas and one-act plays. With time, the club transformed into a group of violinists. The new avatar was named The Peace Club Violinists. Now, there are 50 members between six and 24 years of age. All the members are from Resubelpara. “We have Group A (Senior), Group B (Junior) and Group C (Sub Junior) divided according to their talents and ability,” says Momin, who wears many hats and is the recipient of Meghalaya Day Good Samaritan award and Peace Award, conferred by the SP of North Garo Hills for bringing more than 100 militants into the main stream. When guitar is the most popular musical instrument in Meghalaya, violin comes as an unusual choice. “The sound of violin has a pathos and creates specific thoughts. The amazing sound can break your heart into pieces and make it whole in no time. That is the beauty of this instrument. There is something peaceful about the sound and so we chose this instrument,” says Momin about the soulful music of violin. Momin says he finds inspiration in the works of European Violin King called Andrew Rieu. “I befriended him on Facebook and then we shared our thoughts on WhatsApp,” says the musician, composer and writer. All the members of the group are trained in Resubelpara and most of the music lessons were taken online and from videos on YouTube. Members usually train themselves during holidays to avoid neglecting studies. Momin says he makes sure that the young violinists also excel in education. The Peace Club started as the youth wing of the Peace Coordination Committee that was set up in Resubelpara during the Rabha-Garo conflict. From 2012 onwards, United Christian Peace Forum has worked as the peace initiator in the insurgency-hit region of Garo Hills. Besides creating soulful music, the group has also worked towards reforming militants, living up to its name. “If we need development in the state we first have to bring peace,” says the master. Coming from a trouble-torn area, all members value peace and are dedicated to bring about change through music. The members are actively involved in social work. They had provided relief and rehabilitation to the victims of the 2014 flood in Assam and parts of Meghalaya. They have also received an award from the district administration for best relief work. The Peace Club works towards green cause and plants trees on school campuses and at railway sides. It plays an important role in the district when it comes to saving the wildlife. So far, the club members, along with the district police and state wildlife department, have recued more than 20 endangered species of turtles. Momin says in this militancy-hit district, their music has played a therapeutic role. “There was a time when North Garo Hills was a den of dreadful militants. News of killing, extortion, kidnapping were regular between 2011 and 2018. People remained silent out of fear. But the Peace Committee did not bother about the threatening of militants and it appealed to them to come to the main stream. All of them have surrendered now. We upload our music on YouTube, WhatsApp and Facebook, which they see and decide to walk on the right path. We stress on non-violence,” explains Momin, who had received death threats from militants in the past. Many members had earlier quit the club after threats from GNLA and other militants but Momin was determined to make a change through music and goodwill. Other members of the club include JM Sangma as secretary, JK Sangma as accountant, RK Sangma as treasurer, church leaders, pastors and teachers who constantly support and advise the members. Momin says he was drawn to the sound of violin when he was a child. But as the instrument was expensive, he purchased an ordinary one and tried to practise in his own way. “Unfortunately the conflict between Garo and Rabha broke out and so I stopped. It was idly hanging on my wall while I was busy at relief camps, appealing for peace in the border villages. I was also busy writing scripts for one-act plays. But with time, I got convinced that violin can do much more than drama or one act play. And it did,” he says. Initially, people would not appreciate the endeavour but the club’s determination changed everything. 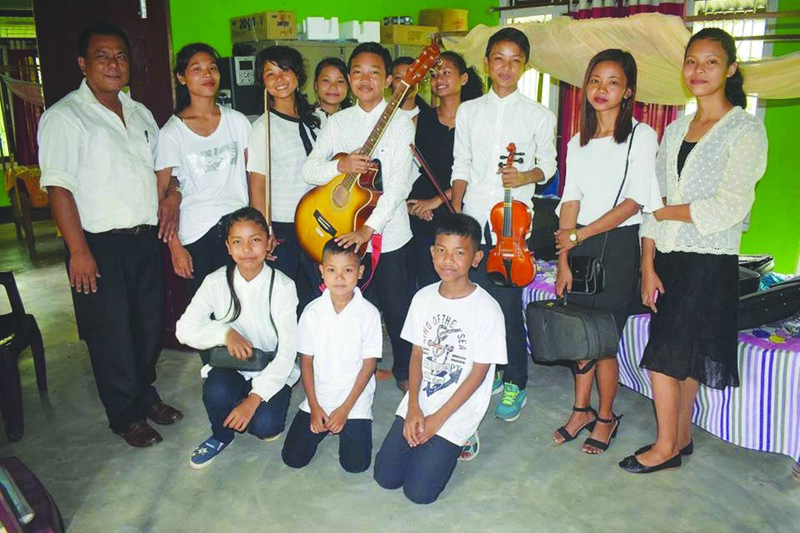 The violinists have performed in Shillong, Goeragre, Tura, Dolvan in Gujarat and Agartala, besides several stage performances in North Garo Hills. Momin also wants to visit Shillong, often considered as the rock capital of the country, and share with youngsters the qualities of violin. “This instrument cannot be easily taught in a short period of time. Unlike guitar, violin has only imaginary lines; it is rested between the shoulder and chin and held with one hand with the bow on the other. It is so difficult to create a sound. But once music is made, the graceful sound heals wounded hearts. Meghalaya is highly respected in the world of music in India. When we go to Mumbai, people there say Meghalaya is the land of Chamber Choir,” the musician says. The club members’ perseverance, hard work and curiosity to explore have made them successful and given them recognition. But Momin thinks otherwise. He says behind every successful musician are extremely tolerant family members and neighbours. An aggrieved candidate shows the MTET question paper that was leaked, in the city on Saturday.